Disordered structures offer new mechanisms for forming photonic bandgaps and unprecedented freedom in functional-defect designs. To circumvent the computational challenges of disordered systems, we construct modular macroscopic samples of the new class of PBG materials and use microwaves to characterize their scale-invariant photonic properties, in an easy and inexpensive manner. Hashemizad, S. R., Tsitrin, S., Yadak, P., He, Y., Cuneo, D., Williamson, E. P., Liner, D., Man, W. Using Microwave and Macroscopic Samples of Dielectric Solids to Study the Photonic Properties of Disordered Photonic Bandgap Materials. J. Vis. Exp. (91), e51614, doi:10.3791/51614 (2014). Recently, disordered photonic materials have been suggested as an alternative to periodic crystals for the formation of a complete photonic bandgap (PBG). In this article we will describe the methods for constructing and characterizing macroscopic disordered photonic structures using microwaves. The microwave regime offers the most convenient experimental sample size to build and test PBG media. Easily manipulated dielectric lattice components extend flexibility in building various 2D structures on top of pre-printed plastic templates. Once built, the structures could be quickly modified with point and line defects to make freeform waveguides and filters. Testing is done using a widely available Vector Network Analyzer and pairs of microwave horn antennas. Due to the scale invariance property of electromagnetic fields, the results we obtained in the microwave region can be directly applied to infrared and optical regions. Our approach is simple but delivers exciting new insight into the nature of light and disordered matter interaction. Our representative results include the first experimental demonstration of the existence of a complete and isotropic PBG in a two-dimensional (2D) hyperuniform disordered dielectric structure. Additionally we demonstrate experimentally the ability of this novel photonic structure to guide electromagnetic waves (EM) through freeform waveguides of arbitrary shape. The existence of a bandgap for photons has been the focus of many scientific works, starting from the earlier studies done by Lord Rayleigh on the one-dimensional stop-band, a range of frequencies that are forbidden from propagation through a periodic medium1. Research into electromagnetic wave (EM) propagation in periodic structures has really flourished in the last two decades after the seminal publications of E. Yablonovitch2,3 and S. John4. The term “photonic crystal” was coined by Yablonovitch to describe the periodic dielectric structures that possessed a photonic bandgap (PBG). Photonic crystals are periodic dielectric structures possessing discrete translational symmetries, rendering them invariant under translations in directions of periodicity. When this periodicity is matched with the wavelengths of incoming electromagnetic (EM) waves, a band of frequencies becomes highly attenuated and may stop propagating. If wide enough, the ranges of the forbidden frequencies, also called stop bands, may overlap in all directions to create a PBG, forbidding the existence of photons of certain frequencies. Conceptually, EM wave propagation in photonic crystals is similar to electron wave propagation in semiconductor materials, which have a forbidden region of electron energies, also known as a bandgap. Similar to the way engineers have employed semiconductors to control and modify the flow of electrons through semiconductors, PBG materials can be used for various applications requiring optical control. For example, PBG materials can confine light of certain frequencies in wavelength size cavities, and guide or filter light along line defects in them5. PBG materials are suggested to be used for controlling the flow of light for applications in telecommunication6, lasers7, optical circuits and optical computing8, and solar energy harvesting9. A two-dimensional (2D) square lattice photonic crystal has 4-fold rotational symmetry. EM waves entering the crystal at different angles of incidence (for example, 0° and 45° with respect to the lattice planes) will face different periodicities. Bragg scattering in different directions leads to stop bands of different wavelengths that may not overlap in all directions to form a PBG, without very high refractive-index contrast of the materials. In addition, in 2D structures, two different EM wave polarizations, Transverse Electric (TE) and Transverse Magnetic (TM), often form bandgaps at differing frequencies, making it even harder to form a complete PBG in all directions for all polarizations5. In periodic structures, the limited choices of rotational symmetry lead to intrinsic anisotropy (angular dependence), which not only makes it hard to form a complete PBG, but also greatly limits the design freedom of functional defects. For example, waveguide designs are proven to be restricted along very limited choices of major symmetry directions in photonic crystals10. Inspired to surpass these limitations due to periodicity, much research has been done in the past 20 years on unconventional PBG materials. Recently a new class of disordered materials was proposed to possess an isotropic complete PBG in the absence of periodicity or quasiperiodicity: the hyperuniform Disorder (HD) PBG structure11. The photonic bands do not have exact analytical solution in disorder structures. Theoretical study of the photonic properties of the disordered structures is limited to time–consuming numerical simulations. To calculate the bands, the simulation needs to employ a super-cell approximation method and the available computational power may limit the finite size of the super-cell. To calculate transmission through these structures, computer simulations often assume ideal conditions and thus neglect real world problems like the coupling between the source and detector, the actual incident EM wave profile, and alignment imperfections12. Furthermore, any modification (defect design) of the simulated structure would require another round of simulation. Due to the large size of the minimum meaning for super-cell, it is very tedious and impractical to systematically explore various defect design architectures for these disordered materials. We can avert these computational problems by studying the disordered photonic structures experimentally. Through our experiments we are able to verify the existence of the complete PBG in HD structures. Using microwave experiments, we can also obtain phase information and reveal the field distribution and dispersion properties of existing photonic states in them. Using an easily modifiable and modular sample at cm-scale, we can test various waveguide and cavity (defect) designs in the disordered systems and analyze the robustness of the PBGs. This kind of analysis of complex disordered photonic structures is either impractical or impossible to obtain through numerical or theoretical studies. The design process begins by selecting a “stealthy” hyperuniform point pattern13. Hyperuniform point patterns are systems in which the number variance of the points within a “spherical” sampling window of radius R, grows more slowly than the window volume for large R, that is, more slowly than Rd in d-dimensions. For example, in a 2D Poisson random distribution of point pattern, the variance of the number of points in domain R is proportional to R2. However, in a hyperuniform disorder point pattern, the variance of the points in a window of radius R, is proportional to R. Figure 1 shows a comparison between a hyperuniform disordered point pattern and a Poisson point pattern11. We use a subclass of hyperuniform disordered point patterns called “stealthy”11. Using the design protocol described in Florescu et al11, we construct a network of dielectric walls and rods, creating a 2D hyperuniform dielectric structure similar to a crystal, but without the limitations inherent to periodicity and isotropy. The wall networks are favorable for TE-polarization bandgap, while the rods are preferable for forming band gaps with TM-polarization. A modular design was developed, so that the samples can be easily modified for use with different polarizations and for introducing freeform waveguides and cavity defects. Due to the scale invariance of Maxwell’s equations, the electromagnetic properties observed in the microwave regime are directly applicable to the infrared and optical regimes, where the samples would be scaled to micron and submicron sizes. Chose a subclass of 2D hyperuniform disorder point pattern (blue circles in Figure 2) and partition it (blue lines in Figure 2) using Delaunay tessellation. A 2D Delaunay tessellation is a triangulation that maximizes the minimum angle for each triangle formed and guarantees there are no other points inside the circumcircle of each triangle11. Locate the centroids of each triangle (solid black circles in Figure 2); these centroids are the locations of the dielectric rods of radius r11. Connect the centroids of the neighboring triangles (thick red lines in Figure 2) to generate cells around each point11. Create the CAD design file for the 2 cm tall HD base template with holes and slots on which the rods and walls will be assembled14. Use an HD pattern with the average inner-rod spacing of a=1.33 cm and set the hole-radius to be 2.5 mm and slot-width to be 0.38 mm. Set the depth for holes and slots to be 1 cm deep to stabilize the inserted rods and walls. Create a similar CAD design file for the crystalline base template (a square lattice) for comparison14. Use the same lattice constant as the HD structure (1.33 cm) and the same hole-radius (2.5 mm) and slot-width (0.38 mm). Fabricate the template. Manufacture the HD and Square lattice plastic bases by using a stereolithography machine that produces a solid plastic model by ultraviolet laser photo-polymerization. Use a clear resin, for example polycarbonate-like plastic. The resolution is 0.1 mm in both lateral and vertical directions. (See Figure 3, center panel). Prepare the building blocks: Order commercially available Alumina rods and thin walls cut to precise dimensions (see Figure 3, left panel). Set the height to be no less than a few wavelengths, for example 10.0 cm. The diameter of all rods is 5.0 mm. Wall thickness is always 0.38 mm and widths vary from 1.0 mm to 5.3 mm, with 0.2 mm increments. Construct the defect-free test structure for bandgap measurements. Insert rods and walls into the base for the desired structure architecture. The side view of the constructed network of both rods and walls on the polymer base is shown in Figure 3, right panel. Design a waveguide or a cavity defect: Create various waveguides through the samples by directly removing or modifying rods and walls along the designed path, as shown in Figures 9A and 9C. The modular design of the samples allows fast and easy modification of point and line or curve defects. Use a synthesized sweeper (microwave generator) to provide microwaves with frequency coverage of 45 MHz to 50 GHz with precise 1 Hz frequency resolution. Connect the generator to an S-parameter test set to measure transmission parameters between the two ports (terminals). Use General Purpose Interface Bus (GPIB) links and cables for communications between the sweeper and the test-set. Start/End Frequency. Select the appropriate start and end values of the frequency range for the measurement using the VNA user menu. The relevant frequency range associated with PBG depends on the dielectric index of lattice spacing of the samples. Use 7 GHz to 15 GHz microwaves for the Alumina samples with lattice spacing a=1.33 cm. Averaging Factor. Vector analyzer computes each data point based on the average of multiple measurements to reduce random noise. Select an averaging factor from 512 to 4,096 by inputting the desired multiple on the VNA keypad. Choose a higher averaging factor to minimize noise and chose a lower averaging factor for a quicker scan. Number of Points. For measurements in the 7 GHz to 15 GHz range, chose the maximum number of data points (801), on the VNA on-screen menu, to achieving a frequency resolution of 10 MHz. Calibration. Calibrate the system by directly measuring the relative transmission ratio, and normalize it against the transmission of a pre-calibrated setting with the same background and without the sample between the horn antennas. By doing this, all the background loss due to the cables, adaptors, waveguides, and antennas can be eliminated, and the relative transmission ratio with and without the tested sample is directly recorded. For bandgap measurements, measure the microwave transmission through free space between the horns facing each other at the distance of 28a and save the results as a calibration set in the VNA. Before taking data for the actual experiment with a structure between the horns, turn on the calibration set by selecting “CALIBRATION ON” on the VNA monitor. Data calculated by the VNA will be automatically normalized against the calibration set and return the ratio of transmission power with and without the sample in place. 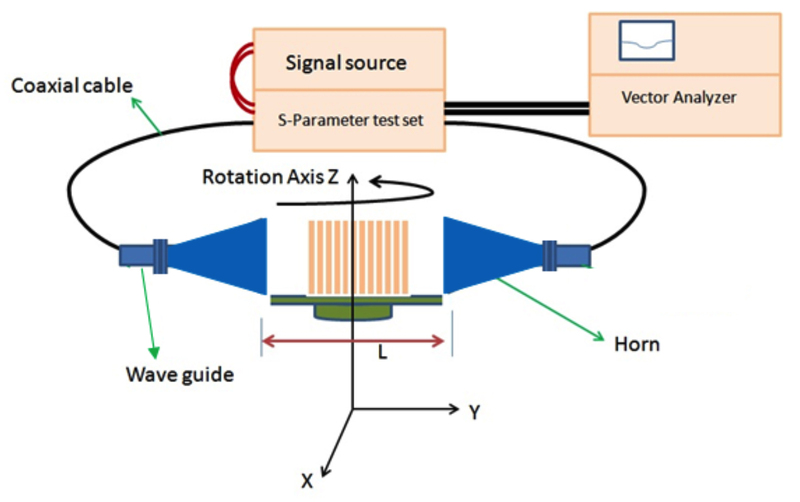 For waveguide measurements, a meaningful calibration is not well-defined, since the transmission through the sample waveguides can easily exceed the calibrated transmission between the two horns in free space. Turn off calibration on the VNA monitor and record the raw transmission, which is the detected signal over the source signal. Place the horns right next to the waveguide channel openings to achieve the best coupling efficiency. Configure the experimental setup shown in Figure 4. Use high quality semi-flexible coaxial cables to connect the S-parameter test-set ports with input/output waveguides. Connect pyramidal horn antennas with the ports through rectangular single mode waveguides and adaptors to ensure the radiation to be linearly polarized, The E-field of the radiation from the horn is parallel to the short edge of the horn. For bandgap measurements: Adhere to the following steps to measure the transmission through the defect-free samples to characterize the PBG of the defect free samples. Align the horns vertically and horizontally to face each other. Arrange the horns at a far enough distance, such as 20 times of the average wavelength, so that the far-field radiation reaching the sample can be approximated to plane waves. Calibrate the transmission between the facing horns in free space without the testing sample and store it in calibration memory. Place defect-free structures made of rods and walls on the rotating stage in between the two facing horns. Turn on the calibration set recorded into VNA memory during step 5.2.1. The system is now ready to measure the relative transmission ratio through the sample normalized against the transmission power of the calibrated memory. Construct various waveguides and cavities by removing or replacing rods and walls in the defect-free structures, as shown in Figures 9A and 9C. Arrange the horns as close to the channel openings as possible to ensure good coupling into the channel. For curved and bent channels center the horns in the middle of the channel with the edge parallel to the opening. Turn off calibration. Now the VNA system is ready to measure and record the raw transmission ratio of the detected power at port 2 over the source power at port 1. Place structures made of rods and walls with a nearly circular boundary on a rotating stage in between the two facing horns. Make sure that the calibration saved in the VNA memory is turned on in step 5.2.2. Zero the angle scale on the rotating stage and measure transmission through the structure. After the initial measurement at zero incident angle, rotate the sample and measure the transmission in equal angle increments, such as every 2° until 180° rotation is reached. Perform all measurements described above in two different polarizations respectively, by changing the horn opening orientations. For TM polarization, set the horns’ short edge (the E-field direction) perpendicular to the horizontal plane of the sample base and parallel to the rods. For TE polarization, rotate the horns 90 degrees, so that their short edges (the E-field direction) are in the horizontal plane. Characterize various waveguides channels: Make sure that the calibration is turned off in step 5.3.3. Place the horns next to the sample for best coupling. Measure the transmission through various channels constructed by removing and/or replacing rods and walls along the channel path. While monitoring the transmission signal on the VNA in real time, modify the channel path by adding and removing extra rods and walls for optimized transmission power or desired filtering bandwidth. Perform analogous measurements similar to what are described above on a square lattice photonic crystal for comparison. Data analysis. Analyze and graph the data using a computer program, such as MATLAB. Plot measured transmission as a function frequency (line plot), such as Figure 5, Figure 2, and Figure 9B and 9D to study the stopgap through the samples or transmission pass though the waveguide channels. Plot transmission as a function of frequency and angle (color contour plot) to analyze the stop bands characteristics of the structures and their angular dependence, as shown in Figure 6 and Figure 7. This protocol suggests presenting the measured transmission through the samples as a function of frequency and incident angle in polar coordinates12, in order to directly visualize the rotational symmetries and angular dependence of photonic properties. Generate the polar-coordinate plots to directly show the Brillouin zone boundaries of crystalline structures and reveal the relationship between PBG formation and Bragg scattering planes (Brillouin zone boundaries) in crystals and quasicrystals. We have achieved the first confirmation ever of an isotropic complete PBG present in hyperuniform disorder dielectric structures. Here, we present our HD structure results and compare them to that of a periodic square lattice photonic crystal. 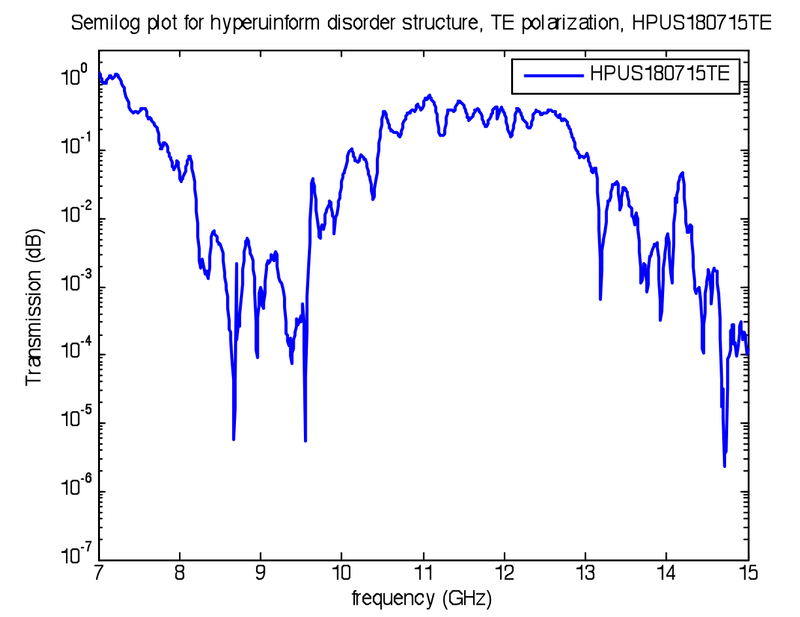 Figure 5 shows a semi-log plot of TE polarization transmission (dB) vs. frequency (GHz) for a hyperuniform disorder structure at one incident angle. This plot shows that the stop band region is located approximately between 8.5 and 9.5 GHz, where transmission intensity drops more than two orders of magnitudes. As discussed above, we use a periodic square crystal model for comparison to our HD structure. Figure 6 presents measured transmission (color) as a function of frequency and incident angle for the square lattice, in TE polarization. The blue color (low transmission) represents the stop band in the frequency domain at a given angle. The measured stop bands show strong angular dependence associated with its 4-fold rotational symmetry. The stop band in one direction at zero degrees differ too much from that at 45° to allow overlapping and formation of TE polarization bandgap in this square lattice structure. Figure 7 shows the unique polar plot comparison of transmission properties of the square lattice sample and HD sample. Polar plots enable us to visualize the effective Brillouin zone boundaries5 and the angular dependence of the stop bands. The transmission intensity is shown in color as a function of frequency (r=f) and the incident angle (q=q). 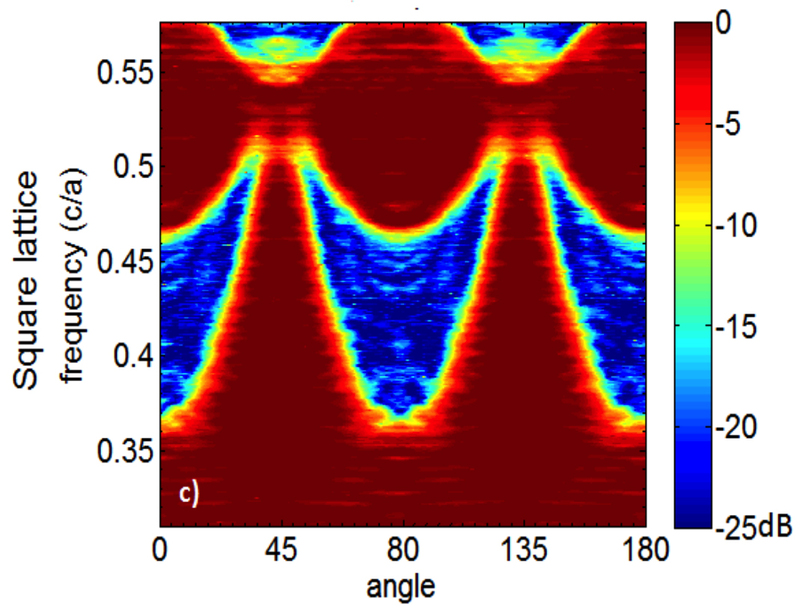 Stop bands due to Bragg scattering appear along the square-shaped Brillouin zone boundaries. As explained before, the variations with angle prevent the formation of a PBG (blocking at all directions) for this square lattice. For the HD sample, stop gap form isotropic PBG in all directions. Figure 8, shows the measured TM transmission vs. frequency through a straight waveguide channel of width 2a, created by removing rods and walls along the path in the hyperuniform disorder structure. The pink strip shows the TM polarization PBG of the defect-free HD structure. When the channel is introduced, a broad band is guided through the open channel. The flexibility offered by this isotropic disordered PBG structure makes it possible to form unprecedented freeform channels with arbitrary bending angles and to decorate their sides, corners and centers with rods and walls for tuning and optimizing the transmission bands. Figure 9A shows a photo of the HD structure with a waveguide channel of 50º angle bending. Figure 9B shows transmission through this channel, which is comparable to what we get through the straight waveguide despite of the sharp bend. Figures 9C and 9D show an s-shape channel design and its transmission respectively. These experiments once again attest to the flexibility of the HD structure for functional defect design, because these types of channels would be impossible to achieve in the highly symmetric periodic lattice of regular photonic crystals. Figure 1. Disordered point patterns. Left, a 2D Poisson random distribution point pattern, the variance of the number of points in a window with radius R is proportional to R2. Right; a hyperuniform disorder point pattern, the number variance of in the window is proportional to the radius R itself11. Please click here to view a larger version of this figure. Figure 2. A sketch of the design protocol of 2D hyperuniform disorder structures possessing a complete PBG11. This figure shows a subclass of 2-D hyperuniform disorder point pattern (blue circles) and partitioned by blue lines using Delaunay tessellation. A 2D Delaunay tessellation is a triangulation that maximizes the minimum angle for each triangle formed and guarantees there are no other points inside the circumcircle of each triangle11. The centroids, shown as black circles, are the locations of the dielectric rods of radius r11. 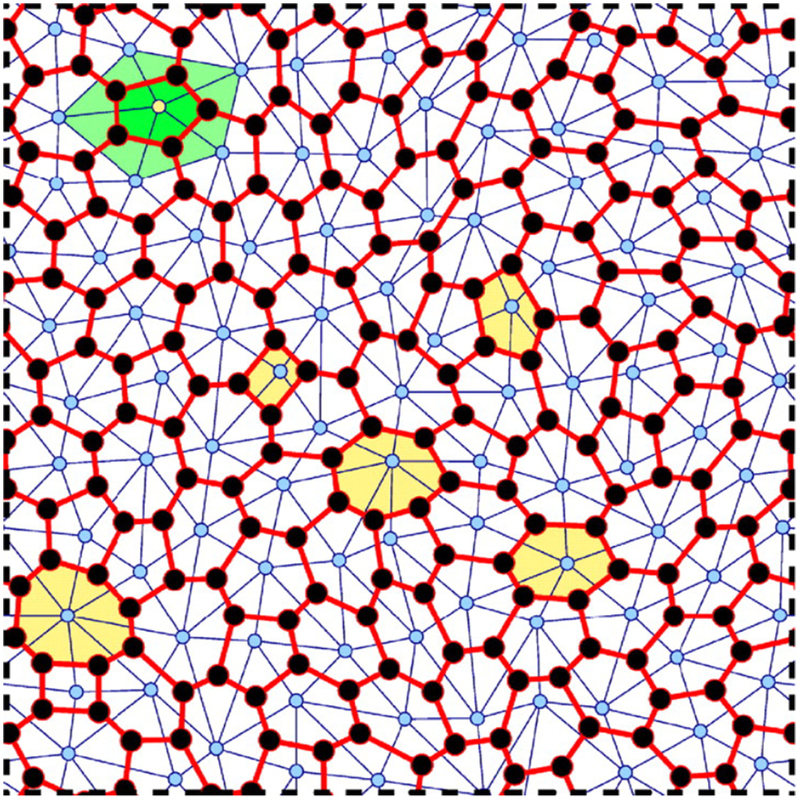 The centroids are connected with red lines to generate cells around each lattice point. Please click here to view a larger version of this figure. Figure 3. 2D hyperuniform Disorder sample used in the experiment. Left: Alumina rods and walls used as building blocks. The diameter of all rods is 5.0 mm. Wall thickness is always 0.38 mm and widths vary from 1.0 mm to 5.3 mm, with 0.2 mm increments. Center: plastic base template with holes and slots for assembling the HD structure. The base is a square with 25.4 cm sides and 2 cm height. Right: side view of an assembled HD alumina structure. Please click here to view a larger version of this figure. Figure 4. A sketch of the experiment setup. Signal generator is connected to the S-Parameter Test set and analyzed by the Vector Network Analyzer (VNA). Both ports of the test set are connected to waveguide horn antennas by coaxial cables. The sample is placed between the horns on a rotating stage. The VNA send the data to the computer through the GPIB connection (not shown). Please click here to view a larger version of this figure. Figure 5. A semi-log plot of TE transmission (dB) vs. frequency (GHz) through a hyperuniform disorder structure at one incident angle. A bandgap, characterized by a sharp drop in transmission, can be seen in the region of 8-10 GHz. Please click here to view a larger version of this figure. Figure 6. Measured square lattice TE polarization transmission (dB) shown in color as a function of both frequency (units of c/a) on the y-axis and incident angle (degrees) on the x-axis. This plot shows the angular dependence of the TE bandgap in a periodic square lattice crystal. Please click here to view a larger version of this figure. Figure 7. Measured TE polarization transmission (dB) shown in color as a function both of frequency (c/a) as the radial coordinate and incident angle (degrees) as an azimuthal coordinate: (A) square lattice sample. (B) hyperuniform disorder sample. Please click here to view a larger version of this figure. Figure 8. Straight channel waveguide in a HD structure: (A) a photograph of the HD sample with a line-defect waveguide channel, (B) measured TM transmission ratio of the detected power over source power through the channel as a function of frequency in units of c/a where c is the speed of light in a vacuum and a = 1.33 cm is the average spacing between lattice points. TM Bandgap range is shown by the pink strip. The peak signal at 0.41 c/a is the guided mode in the channel. Please click here to view a larger version of this figure. Figure 9. Various waveguide channels through the HD structure and the measured transmission spectra as a ratio of the detected power over source power. Transmission is plotted as a function of frequency in units of c/a. The pink strip indicates the TM PBG range. (A) Photograph of an HD structure with a 50° bent channel and (B) the transmission spectra through the structure showing the guided mode around 0.42 c/a (C) photograph of an HD structure with a freeform s-shape channel and (D) the transmission spectra through the s-shape channel showing the guided mode around 0.42 c/a. Please click here to view a larger version of this figure. Starting from a hyperuniform disordered point pattern, 2D HD structures consisting rods and/or wall network can be designed to obtain a complete PBG for all polarization11. Based on the design, we constructed a template with holes and slots for assembling 2D Alumina rods and walls structures at cm-scale which could be tested with microwaves. We chose to work with microwaves, because cm-scale building blocks, such as Alumina rods and walls, are inexpensive, and easily handled. We have experimentally demonstrated for the first time that it is possible to have an isotropic complete PBG in 2D hyperuniform disorder structures. This class of disordered lattices does not possess long-range translational order and therefore the bandgap formation is not attributed to Bragg scattering as it is in periodic photonic crystals. Unlike periodic photonic crystals, which have very few choices of rotational symmetries and intrinsically limit defect design freedom5, the HD structure provides some advantages for PBG applications not allowed in photonic crystals. The assembly of the structure for TM bandgap measurement takes just a few minutes, while the addition of sheets for TE bandgap measurement can take up to 1 hr. Once the defect-free HD sample is assembled with Alumina rods and walls, it can serve as a modifiable template, in which waveguides and cavities can be quickly formed by strategically removing some rods and walls. In this new class of HD PBG materials, we have demonstrated freeform waveguiding along arbitrary paths unlimited by crystalline symmetry directions14, filtering and splitting 15, and cavity resonant modes16. The experimental methods described here are easy to follow and reproduce. The experimental protocol can be modified to suit the needs of any experimenter working with other artificial photonics materials that are difficult to study with simulations or with micron-fabrication, because of their complexity, disorder, or defect architecture. Using these methods, we also demonstrated and characterized other quasi-crystalline structures and HD structures made with 3D-printed plastic, which possess single polarization PBGs17,18. There are only a few steps to consider for ensuring the success of the experiment. The materials used to construct the sample need to have little absorption. The choice of the dielectric contrast and lattice spacing determines the resulted PBG frequencies. For example, Alumina rods and walls structures with a dielectric-contrast of 8.76 and a lattice-spacing of 1.33 cm has a bandgap centered around 10 GHz. 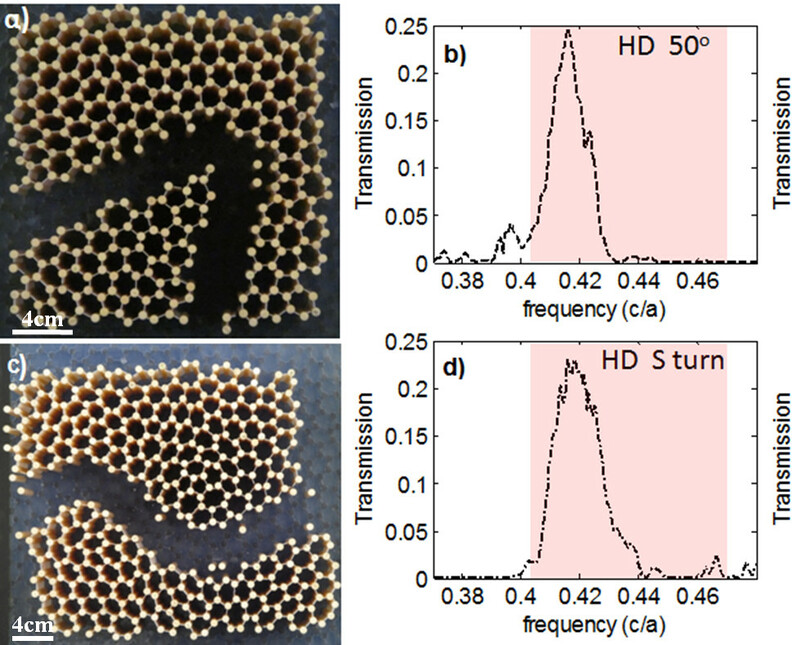 Similar HD structures made of plastic materials with dielectric-contrast of 2.56 and a lattice spacing of 0.6 cm have band gaps centered around 23 GHz. For different frequency ranges, horns and adapters designed for different microwave bands need to be chosen correctly. It is fine to stretch the measured frequency range of X-band (8-12 GHz) microwave horns and adapters to 7-15 GHz at most. Beyond that range, different components for other microwave bands need to be used. To ensure plane polarized waves in the structure, horns must be placed far apart, while for waveguiding channels horns have to be placed directly to the opening. One limitation of this technique is its restricted relevance to real-world applications to technology. Structures built with cm-scale components are not directly applicable as photonic devices. The waveguides, splitters and resonant cavities studied with this technique are essentially “proof of concept” constructions meant to improve our knowledge of interaction between EM waves and disordered media. However, as described above due to the scale-invariance of EM waves, all the results obtained using microwave and cm-scale samples can be directly applied to infrared and optical frequencies when the structures are shrunk to micron and submicron scale. Common fabrication methods for submicron scale photonic crystals, including E-beam lithography and two-photon-polymerization can be used to fabricate these PBG materials in IR and optical regions for various applications. There are many advantages of our microwave experiments for studying photonic properties of complex PBG materials over experimentation using IR. First, the cost of fabricating devices for testing at the micron scale is very high. Devices have to be precisely manufactured in cleanroom facilities. Furthermore, the two methods of coupling IR waves into 2D slabs of photonic devices under test (DUT) are problematic. One method is to use a tapered vertical coupler19 to couple with focused optical fibers, which often offers a very narrow testing bandwidth (i.e., from 1.5 mm to 1.6 mm, 6% from the central wavelength of 1.5 mm), compared with the very wide testing ranges of microwave antennas, such as 7 to 17 GHz with one sets of adapters and antennas. The other method of introducing IR waves into the DUT is to use edge fiber couplers, which can cover a wider testing range but are prohibitively expensive due to packaging costs, Therefore, the microwave regime offers the experimenter great freedom of design with a choice of inexpensive materials, easy to use testing instruments with wide frequency ranges, modular lattice architecture and the convenience of real-time analysis. The bandgap concepts probed and discovered through the microwave approach include a greater understanding of the fundamental mechanism for PBG formation and the interplay between the geometry of the structure and the incident radiation. Future applications of this technology will include 1) to continue applying the microwave testing methods to explore and optimize designs for functional photonic devices for paving the road of applications of HD PBG materials and 2) to scale the samples down to the IR and optical regime for real application that uses a photonic bandgap, such as sensors20, telecommunication6, and optical micro-circuits8. This work was partially supported by the Research Corporation for Science Advancement (Grant 10626), National Science Foundation (DMR-1308084), and the San Francisco State University internal award to W. M. We thank our collaborator Paul M. Chaikin from NYU for helpful discussions in experimental design and for providing the VNA system for us to use on site at SFSU. We thank our theoretical collaborators, the inventor of the HD PBG materials, Marian Florescu, Paul M. Steinhardt, and Sal Torquato for various discussions and for providing us the design of the HD point pattern and continuous discussions. Strut, J. W. The propagation of waves through a Medium Endowed with a Periodic structure. Philosophical magazine. XXIV, 145-159 (1887). Yablonovitch, E. Inhibited spontaneous emission in solid-state physics and electronics. Phys. Rev. Lett. 58, 2059-2062 (1987). Yablonovitch, E., Gmitter, T. J. Photonic band structure: The face-centered-cubic case. Phys. Rev. Lett. 63, 1950-1953 (1989). Sajeev, J. Strong localization of photons in Certain Disordered Dielectric super lattices. Phys. Rev. Lett. 58, 2486-2489 (1987). Joannopoulos, J., Johnson, S. G., Winn, J. N., Mead, R. D. Photonic Crystals: Molding the Flow of Light. 2nd ed, Princeton University Press. Princeton, New Jersey. 243-248 (2008). Noda, S., Chutinan, A., Trappin Imada, M. emission of photons by a single defect in a photonic bandgap structure. Nature. 407, 608-610 (2000). Cao, H., Zhao, Y. G., Ho, S. T., Seeling, E. W., Wang, Q. H., Chang, R. P. Random laser action in semiconductor powder. Phys. Rev. Lett. 82, 2278-2281 (1999). Chutinan, A., John, S., Toader, O. Diffractionless flow of light in all-optical microchips. Phys. Rev. Lett. 90, 123901 (2003). Vynck, K., Burresi, M., Riboli, F., Wiersma, D. S. Photon management in two-dimensional disordered media. Nature Mater. 11, 1017-1022 (2012). Ishizaki, K., Koumura, M., Suzuki, K., Gondaira, K., Noda, S. Realization of three-dimensional guiding of photons in photonic crystals. Nature Photon. 7, 133-137 (2013). Florescu, M., Torquato, S., Steinhardt, P. J. Designer disordered materials with large, complete PBGs. Proc. Natl. Acad. Sci. 106, 20658-20663 (2009). Man, W., Megens, M., Steinhardt, P. J., Chaikin, P. M. Experimental measurement of the photonic properties of icosahedral quasicrystals. Nature. 436, 993-996 (2005). Torquato, S., Stillinger, F. H. Local density fluctuations, hyperuniformity, and order metrics. Phys. Rev. E. 68, 041113 (2003). Man, W., et al. Isotropic band gaps and freeform waveguides observed in hyperuniform disordered photonic solids. Proc. Natl. Acad. Sci. 110, 15886-15891 (2013). Man, W., et al. Freeform wave-guiding and tunable frequency splitting in isotropic disordered photonic band gap materials. Frontiers in Optics 2012/Laser Science XXVIII, OSA Technical Digest (online). Optical Society of America. Available from: https://www.osapublishing.org/abstract.cfm?uri=FiO-2012-FTh2G.5 (2012). Tsitrin, S., et al. Cavity Modes Study in Hyperuniform Disordered Photonic Bandgap Materials. Frontiers in Optics 2012/Laser Science XXVIII, OSA Technical Digest (online). Optical Society of America. Available from: https://www.osapublishing.org/abstract.cfm?uri=FiO-2012-FTh3F.4 (2012). Man, W., et al. Photonic band gap in isotropic hyperuniform disordered solids with low dielectric contrast. Opt. Express. 21, 19972-19981 (2013). Man, W., et al. Experimental observation of photonic bandgaps in Hyperuniform disordered materials. Conference on Lasers and Electro-Optics, 2010 May 16-21, San Jose, United States, (2010). Schelew, E., et al. Characterization of integrated planar photonic circuits fabricated by a CMOS foundry. Journal of Lightwave Technology. 31, (2), 239 (2013). Guo, Y. B., et al. Sensitive molecular binding assay using a photonic crystal structure in total internal reflection. Opt. Express. 16, 11741-11749 (2008).